UCLA kicked off the Post-Nelson Era on Saturday, with a satisfying, fear-quelling 77-73 victory over the Penn Quakers. The Ivy Leaguers from Pennsylvania played with heart, coming back from a 14-point deficit to make it interesting, but the Bruins’ height advantage and superior inside play made the difference. The Bruins won the Points-in-the-Paint battle 34-16, to offset 11 missed Free Throws, and a career-game by one of the Quakers. While Penn’s leading scorer was shut down, as Howland Teams have a history of doing, another player went off for 8 Three’s and 29 Points. But it wasn’t enough for the Quakers, who couldn’t contend with the Wears or Josh Smith inside the key. David Wear pulled down a dozen Boards, and scored 11 Points, while Josh Smith tallied a half-dozen Caroms, and scored 12 Points. in just 17 minutes (due to his usual foul trouble). 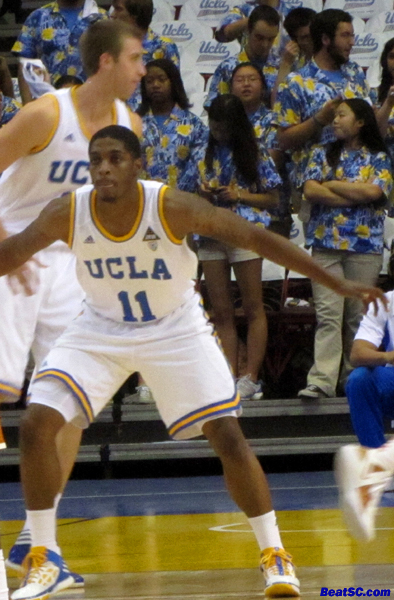 The inside presence is what gave the Bruins an advantage, but the team was actually carried Offensively by Lazeric Jones, who led UCLA in Points, with 21, and dished out 4 Assists. Jones hit all three of his Three’s, and went 7-for-10 from the floor overall. He made three nice drives, with great finishes, two of them over taller defenders. The Bruins played solid defense as well, not allowing much on the inside. They got 4 Steals and 4 Blocks, including 3 by Guards. They worked some ZONE into the gameplan, and it was effective, although Penn got too many wide-open looks from 3-point land. It will take a little more experience playing the Zone to work out all the bugs, but it did show promise. With the Bruins’ slow Guards and with Smith’s foul trouble, Ben Howland has little choice but to keep the Zone in the mix. But the most important thing about the game was that the chemistry and team attitude without Nelson seemed to be fine. In addition to the impressive work by Smith and David Wear inside, Travis Wear also filled the void, with 12 Points, 3 Rebounds, 1 Assist, 1 Block, and 1 Steal. Norman Powell and Jerime Anderson each hit 2 Trey’s, and Jerime led the team with 5 Assists, to round out the team’s “stepping up” to compensate for Nelson’s absence. When De’End Parker returns from injury, the Bruins should be deep enough to compete in the Pac-12. The Bruins led for most of the game, usually by around 8 or so, pumping it up to 14 midway through the second half. Hot shooting late by Penn cut it to 4, and the game was NOT “in hand” until there was less than a minute left. But the Bruins played with poise as the Quakers made their run, and the “close” final minutes will benefit the Bruins the next time they have a tight game. Speaking of close games, the Bruins made the Final Four of Women’s Volleyball, beating #1 Seed Texas on Saturday. Unfortunately, sc came back to beat Pepperdine, so they too will be in the Final Four, on the other side of the bracket from the Bruins. I will let you know if the Bruins triumph further, but if you don’t see anything here, you can assume it went like Men’s Water Polo — The worst possible finish imaginable. "PENN AND QUELLER" was published on December 11th, 2011 and is listed in Blue & Gold News, UCLA/usc/Sports Photos. Would like to see more minutes for Brendan Lane; by all accounts, he is a great student-athlete who has been loyal to the program since day one. I’d like to see Brendan Lane on the court more. Why hasn’t he played very much this season? I am rooting for Mora but I still want Neuheisel to be part of the UCLA family on campus. Perhaps AD?